Though it looks like an undersized joystick, the ergonomic mouse from 3M is really just an ordinary mouse with an unusual shape. It implements the vertical mouse idea in a unique and interesting way – but the location of the buttons may prove a problem for some. 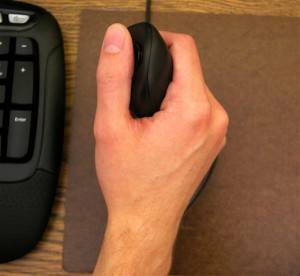 The 3M vertical mouse keeps your hand in the natural “handshake” position. The main problem with an ordinary mouse isn’t so much its lack of “ergonomic” curves, as the position into which it forces your hand. The palm-down posture required by such a mouse causes the wrist to twist. This, in turn, puts strain on the delicate tendons that control the fingers – tendons which run through a passage called the carpal tunnel. Multiplied by thousands of tiny wrist flicks over hundreds of hours a year, this problem can put you on a collision course with RSI. The vertical mouse attempts to alleviate the situation by putting your hand back in the more natural “handshake” position. Judging by the volume of positive Amazon reviews on the 3M version, the concept works really well for a lot of people. Most vertical mouse designs, such as the Evoluent and the AirO2bic mouse, simply take something that looks very much like an ordinary mouse and turn it on its side. The 3M ergonomic mouse, by contrast, departs almost entirely from the traditional mouse shape, with a design that looks more like a joystick. 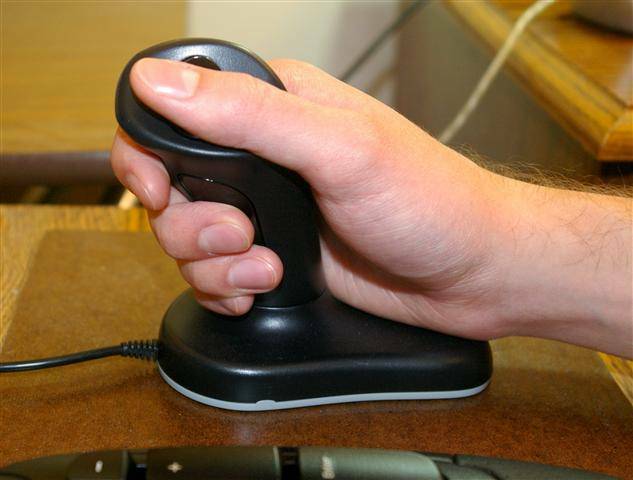 Your fingers are meant to wrap loosely around the joystick part while your thumb perches on top. 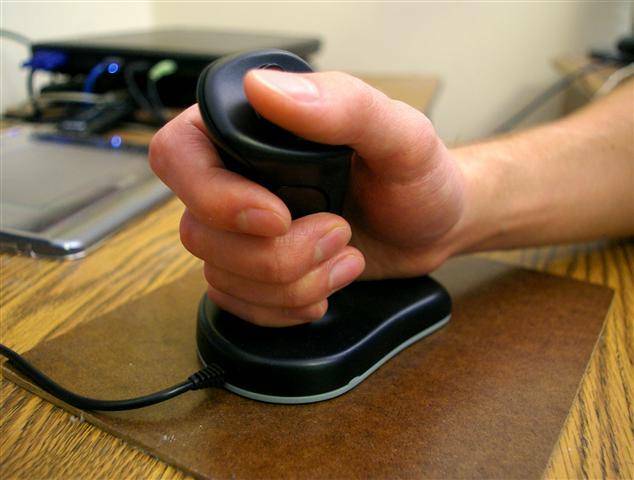 The base plate provides a surface on which to completely rest your hand, which means that little grip is required in order to operate the mouse. 3M offers something its main vertical competitors don’t – namely, a size selection. There are only two different sizes available, large and small – which is somewhat limiting, but still beats one-size-fits-all. I found the large model a bit too large for my sizable hand, but I’m sure the small would have been wrong for me in the other extreme. I think 3M could improve in this area by following the example of the Handshoe and offering more than just two sizes. Unlike most other mice – but like most trackballs – the primary clicking button on the 3M ergonomic mouse is actuated by the thumb. I’m not a big fan of thumb-operated input devices in general, mostly because of problems with my own thumbs that make me unable to use one for any length of time. The 3M was no exception to this rule; after a little while of testing it, my thumb started acting up. Other users have also reported thumb problems after trying the 3M, so this is something to consider carefully. On the upside, clicking with the thumb eliminates the gripping action required by the Evoluent vertical mouse, which uses finger clicks. With the default settings, your thumb does most of the clicking. The result of this script is that the handle button becomes your primary clicker, and the thumb button serves for right- and center-click, an arrangement which I, for one, find much more comfortable and convenient than the default. The downside to using AutoHotKey – apart from the fact that it’s too technical for many people to bother with – is that AHK must be installed and running on every computer where you plan to use the mouse. If it’s not, the mouse will still work but you’ll be back to the uncomfortable and now-unfamiliar defaults. Note: I’m not completely sure that the above remapping scheme will work consistently under all circumstances, as I didn’t have time to test it thoroughly. Your mileage may vary. While it is a 3-button mouse, the 3M vertical lacks a scroll wheel, on top or anywhere else. The 3M ergonomic mouse has no scroll wheel. Instead, you’re supposed to make do with center-click and scroll. I have never found this on-screen-scroll thing to be satisfactory. It distracts me from what I’m reading, it’s always either too fast or too slow, and stopping at the right place is difficult. Now personally, I use a second input device for my scroll wheel, a Wacom graphics tablet nestled neatly between the halves of my Kinesis Freestyle keyboard. Such a dual setup is most convenient – but I digress. This lack of a scroll wheel is, in my view, a big obstacle for the 3M ergonomic mouse. The lowly scroll wheel is one of those things you don’t know you’ve got till it’s gone. This mouse has been hit a lot in Amazon reviews for tracking inaccurately – making it difficult to put the pointer where you want it on the screen. I think the source of some of this bad feedback could be users who are accustomed to mousing from the wrist. The 3M design encourages you to manipulate the mouse from your elbow, keeping your wrist straight. While this technique is great ergonomically, it does compromise accuracy somewhat due to decreased motor control. If you find the 3M ergonomic mouse – or any elbow-operated mouse – difficult to track accurately, the thing to do is to turn down your pointer speed in the control panel. After awhile, as you gain facility with the device, this reduced speed should start to seem slow and you can gradually turn it back up without ruining accuracy. In any category of ergonomic devices, I think the user benefits by having lots of choices, including the unlikely or unusual ones. The 3M ergonomic mouse might be just what some folks need for their particular physical structure and situation. Others may find the Evoluent or the AirO2bic, or something completely different, to be the one for them. One size doesn’t fit all.